"Student property has delivered consistently healthy returns over the past five years. The sector avoided the crash in both capital values and rentals seen in the wider commercial and residential sectors in 2008 and early 2009. "Investors are looking increasingly favourably on the sector as they are attracted by what are perceived to be the contra cyclical properties of investing in Education. Specifically investors are seeking security of income and the wider investment case offered by student property and this is demonstrated by the sharpening of yields over the past 12 months by over 30 basis points - from 6.56% to 6.25% in the 12 months between September 2009 to September 2010. "Full occupancy is a characteristic of the sector. 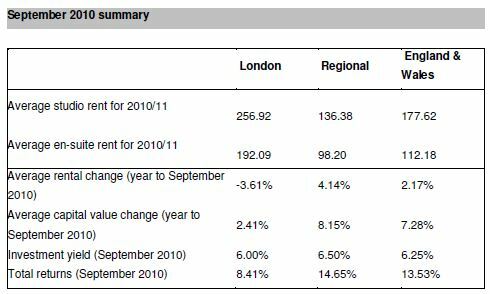 In the regions outside London rents have risen by around 4.1% over the last academic year. In London we have observed some pressure on the high end stock which has resulted in an overall fall of rents this year. "With total returns at 13.5% in September - the sector is continuing to deliver strong and stable performance for investors. The outlook for 2011 is extremely positive. The sector is well positioned to deliver stable and sustainable returns against a turbulent economic backdrop.